In the pre-credits title sequence, a Drax Industries Moonraker space shuttle (during its RAF Boeing 747 piggy-back transport to the UK) was launched atop the carrier jumbo jet by two stowaway pilots, thereby destroying the aircraft and its crew (# 1-3 deaths). 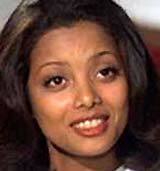 Onboard a private jet returning to the UK after finishing up a job in Africa, Special 007 Agent Bond (Roger Moore) was pre-occupied kissing the flight attendant-hostess (Leila Shenna), when she and the pilot (Jean-Pierre Castaldi) held a gun on him. During a fist fight, the plane's emergency door was opened, and Bond pushed the pilot (with parachute) from the plane, but then he was pushed from behind by metal-toothed Jaws (Richard Kiel) - finding himself free-falling through the air. He narrowly escaped death when he caught up to the pilot and stole his parachute, leaving him to fall to his death (# 4 death, # 1 Bond kill), but then had to fight off Jaws mid-air. After a scuffle, Bond activated his own parachute (to save himself), as Jaws' parachute malfunctioned, and the henchman fell, conveniently, onto a large circus tent canopy. Bond was briefed by "M" (Bernard Lee), gadgets master "Q" (Desmond Llewelyn) and the Minister of Defence Frederick Gray (Geoffrey Keen) in London regarding his mission to find the missing space shuttle. The official version was that the Moonraker, on loan from the Americans to Britain, crashed with the jet over the Yukon. The truth was that there was no sign of Moonraker at the crash site, meaning it had probably been hijacked in mid-air. Bond was to investigate the theft, beginning at Drax Industries in California, a shuttle-manufacturing company that built shuttles for the US government. "Q" provided Bond with a standard-issue, deadly nerve-activated wrist dart gun (with ten darts), after which Bond quipped: "You must get them in the stores for Christmas." In California at LAX airport, Bond was picked up by Drax's personal pilot Corinne Dufour (Corinne Clery), and flown by helicopter to the California estate of billionaire French industrialist Hugo Drax (Michael Lonsdale). They flew over the "very impressive" main Moonraker complex and compound, and Bond exclaimed "Good God" when he saw Drax's residence built in the middle of the desert - a magnificent French chateau, with every stone brought over from France. Very fit astronaut trainees were exercising on the expansive grounds. Bond met the cultured and dignified Drax in his drawing room, where he was playing the piano (Chopin's Raindrop Prelude), and in the company of two lovely ladies: Countess Labinski (Catherine Serre) and Lady Victoria Devon (Francoise Gayat), and his two hunting Doberman pinschers. Drax misapprehended, believing that Bond was there on a "delicate" mission to apologize on behalf of the British government for the loss of the space shuttle, as he paraphrased Oscar Wilde: "To lose one aircraft may be regarded as a misfortune. To lose two seems like carelessness." 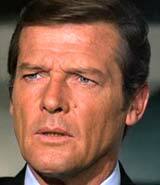 Bond informed him, however, that the crash site had no trace of the Moonraker. Over afternoon tea and cucumber sandwiches, the diabolical Drax described how he also owned subsidiaries throughout the world that constructed components for the manufacture of space shuttles. He asserted: "The conquest of space represents an investment in the future of the entire human race." As Bond departed for an extended tour of the facility, Drax coldly mentioned to his bodyguard-henchman Chang (Toshiro Suga): "Look after Mr. Bond. See that some harm comes to him." Corinne led Mr. 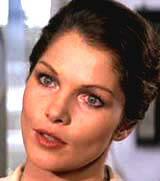 Bond to meet Dr. Holly Goodhead (Lois Chiles), a NASA-trained space scientist on loan. He met her with surprise: "A woman," to which she responded: "Your powers of observation do you credit, Mr. Bond." She took Bond to the centrifuge training area, and invited the agent to experience it - he was firmly strapped into the cockpit chamber. The revolving centrifuge arm was used to simulate weightless-gravity (and force) space conditions for astronauts shot into space. When he asked about its speed, she replied that 3Gs was equivalent to take-off pressure, while most people lost consciousness at 7Gs, and 20Gs was fatal ("Come on, Mr. Bond. A 70 year-old can take 3Gs"). Once the machine was activated, Dr. Goodhead was called away to her office to phone Drax - allowing Chang to increase the speed in the centrifuge's control room to 13Gs. Bond saved himself, when the "chicken switch" malfunctioned, by firing his wrist-mounted explosive dart launcher at the controls to disable the centrifuge. Dr. Goodhead returned to extricate him, although Bond was reluctant about her help as he dizzily climbed out of the cockpit - but he did notice Chang leaving the control room after the failed assassination attempt. During his first night at Drax's palatial mansion, he visited Corinne's bedroom (she was wearing silky lingerie), where she observed: "My mother gave me a list of things not to do on a first date." 007 replied: "Maybe you won't need it. It's not what I came for." He asked for information about Drax's operations, to her surprise, but then kissed her. As they sat together on her bed, she explained how everyone had been working on something "very secret" but everything had been moved to an unknown location. She reclined back, and Bond kissed her again, after asking: "What about that list of your mother's?" She encouragingly replied: "I never learned to read." After love-making (# 1 tryst), Bond left her sleeping on the bed, and intruded into Drax's study, where she followed and inadvertently aided Bond in his investigations by revealing Drax's safe location after glancing in its direction. Bond opened the safe (with a cigarette case safe-cracker gadget) and photographed important blueprints (of a custom-made globe structure made of glass) and classified documents, using a miniature spy camera hidden in a cigarette lighter. The specifications included the name of a glass manufacturing factory in Venice, Italy. As they left the study, they hadn't noticed that their unauthorized entry had been observed by the silent, menacing Chang. The next morning as Bond was chauffeured from the estate to the airport by Frasier in an open car, Drax was out shooting at pheasants, and Bond was invited to momentarily join the hunting party. Drax had also instructed a sniper (Guy Delorme) to kill Bond and make it look like an accident. Although Bond aimed at a pheasant flying by, he shot and killed the Tree Assassin, blithely commenting to Drax that he hadn't really missed ("As you said, 'such good sport'") (# 4 death, # 2 Bond kill). When Corinne's assistance to Bond and betrayal were reported by Chang, Drax terminated her employment immediately - and then she was mauled by Drax's ferocious dogs when they were unleashed by Chang as she fled on foot through the woods (# 5 death). Bond ventured to Venice, Italy, where Drax had a significant business - a glass factory that also manufactured top-secret components. [The factory was identified through the documents in Drax's safe.] At St. Mark's Square (Piazza San Marco), Bond entered the museum-lobby of the Venini Glass Works (taken over by Drax Industries in 1965), and joined its guided tour for visitors to various displays. Also on the tour was Dr. Goodhead, whom he coincidentally encountered outside, although she berated him ("I dislike being spied on"). When he was ingratiating after learning she was addressing a seminar of the European Space Commission, "Heady stuff...I keep forgetting that you are more than just a very beautiful woman," she was offended, and refused his dinner (and drink) invitations. On his way back to his hotel via gondola, Bond was attacked by a knife-throwing 'corpse' concealed in the casket of a passing funeral boat. His gondolier Draco (Claude Carliez) was killed by a hurled knife (# 6 death) - Bond retaliated and threw a wayward knife into the chest of the assassin (# 7 death, # 3 Bond kill). The agent then opened a hidden control panel within the gondola ("Bondola") - and flicked a switch to drop down a propeller-driven motor to facilitate his escape from a machine-gun armed thug shooting at him from a pursuing speedboat. [The entire chase sequence was reminiscent of the one in The Man With the Golden Gun.] After slicing through a gondola (with two oblivious lovers kissing) and evading the speedboat attack, Bond arrived at St. Mark's Square, where he again opened the control panel and converted the gondola into a land-capable hovercraft, with a steering column and drop-down wheels. He drove it through the square, astounding many bystanders (a pigeon did a double-take, and a distracted waiter poured a drink onto a customer). That evening, dressed as a gondolier, Bond returned to the glass factory, where he infiltrated and watched as a white-coated laboratory technician entered a passcode (the five note leitmotif from Close Encounters of the Third Kind (1977)) to enter a top-secret, glass-walled research facility. He observed as two technicians placed liquid-filled glass vials or cylinders into strange globe-shaped mechanisms. He was interrupted in his brief investigation by the two returning technicians, and hurriedly placed one vial in his pocket as a stolen sample. He carelessly left another one on a globe as he left. From a distance in a hiding spot, he watched as it was dislodged and fell to the floor, shattering and spilling its poisonous lethal nerve gas contents - and killing the two lab technicians almost instantly (# 8-9 deaths), but the gas was not harmful to laboratory rats. During Bond's escape, Chang (in full armored Kendo attire) cornered and attacked him in the showroom of the glass factory museum in a well-choreographed fight sequence. After a long and destructive struggle during which most of the display cases were demolished, the two fought further in an upstairs storage area, where 007 hurled Chang to his death through an ornate glass clock face on the building's second story into the piazza below (# 10 death, # 4 Bond kill). Chang landed headfirst in a piano in an outdoor entertainment area (Bond: "Play it again, Sam"). Bond made a mental note of wooden crates (marked C and W) stacked on the lower level (containing the globe mechanisms), bound for Rio de Janeiro - evidence that Drax was moving his facility to Brazil. Bond confronted Dr. Holly Goodhead in her spacious hotel bedroom, where he noticed champagne cooling in an ice bucket (Bond: "Bollinger. If it's '69, you were expecting me"). He soon suspected she was an agent, noting her hypodermic syringe fountain pen ("Not what I want to get stuck with tonight"), her dart-throwing diary ("fairly deadly diary"), a flame-throwing atomizer ("Trifle overpowering, your scent"), and a radio receiver and aerial concealed within her handbag - all standard CIA-issued equipment. 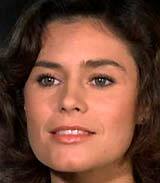 She was revealed to be an undercover CIA agent, planted into Drax' SoCal organization. He astutely noted: "I have friends in low places" - a reference to his association with CIA agent Felix Leiter from previous films. She suggested working with him: "Could this possibly be the moment for us to pool our resources?" - and they kissed for the first time. He agreed: "We'd be better off working together. Detente?" And then they sank down onto her bed to consummate their new alliance with a romantic truce (# 2 tryst). Bond snuck away before she awakened. The next day, Bond pushed "the panic button" by summoning "M" and the Minister of Defence to Venice, to further investigate and stage a raid on the glass factory's secret laboratory. Donning gas masks when they entered, they found it transformed and converted into a palatial room/office, with Drax awaiting them. He was confused and mocked their entry: "You must excuse me, gentlemen, not being English, I sometimes find your sense of humor rather difficult to follow." The Minister apologized for humiliating Drax, and Bond was chastised and relieved of his assignment. However, "M" gave Bond the benefit of the doubt and granted him two weeks leave, so he could pursue the case privately in Rio. In the meantime, Bond asked for "Q" to do an analysis of the vial sample (with lethal contents) from the lab. For Drax, a minor crisis had been averted, but he ordered "all merchandise" to be rerouted (from Rio to elsewhere). And he called for a replacement for bodyguard Chang, hiring Jaws. Bond flew on an Air France Concorde to Rio de Janeiro, Brazil, and while on his way from the airport to his hotel, he saw that he was followed by a woman in an open convertible snapping photographs. After he was lodged in the President's suite, he was attended by the same woman - Manuela (Emily Bolton), who was at the in-room mini-bar fixing him a vodka martini ("Shaken, not stirred"). She identified herself as his field agent contact from Station VH, there to assist him, and knew that the initials C and W (from the crates he had seen in Venice) belonged to a large import company in Rio, a subsidiary of the Drax Group. He explained how he wanted to pay a "discreet visit" to the warehouse (on Carioca Avenue) that evening, but meanwhile would kill time by having an intimate romantic interlude with her (Bond: "How do you kill five hours in Rio if you don't samba?") - he loosened the waist tie-string on the white gown of his willing Brazilian helper (# 3 tryst). That evening, Manuela escorted Bond through a crowd of party-goers at the Rio carnival, on their way to the warehouse. The building seemed to be empty, except for a packing label-sticker marked "Drax Air Freight." In the alleyway, defenseless Manuela (holding up a knife from her handbag) was menaced by clown-costumed Jaws (who approached for a neck-bite), necessitating her rescue by Bond. Jaws was swept away by a group of party revellers before he could retaliate. Manuela knew that Drax's Air Freight was operated through the airport at San Pietro. The next morning at an overlook, Bond discovered, by a telescopic sighting (while monitoring Drax's air freight flights leaving every two hours), that Holly had also arrived in Rio ("Haven't we met before somewhere?"). He regarded their relationship as "chilly since Venice," although she claimed he walked out on her, after their one-night stand. He suggested that they team up and work together properly: "Why waste time working against each other?" - and he briefed her on his findings - the warehouse was empty because Drax was "moving out." However, they still shared a mutual distrust of each other (Bond: "That's what makes it more exciting, doesn't it?"). Bond and Holly took a cable-car ride together to the top of Sugarloaf Mountain (above Rio, a tourist attraction). As they ascended, Jaws halted their cable's drive-wheel in the control room and bit into the steel tramway cable that suspended their car. While their car was stalled, Jaws then climbed along another parallel steel cable until he reached a second bubble-shaped cable car. Jaws' car and Bond's car were brought alongside each other by another henchman at the controls in the control room, and the two struggled atop one of the cars. Bond pushed Jaws down through an opening in the cable car roof and locked him inside. Then, Bond and Holly escaped by sliding down the cable on a chain (as a zip-line) - and jumped to safety as Jaws's cable-car crashed into the control station, but he miraculously survived. Climbing out of the wreckage, the hulking Jaws was assisted from the rubble by small but super-strong, buxom future girlfriend Dolly (Blanche Ravalee) with spectacles and pigtails. Experiencing love at first sight, they walked away affectionately holding hands. Holly kissed Bond to reward him for saving her life, and he was appreciative: "Remind me to do it more often." But their continued kissing was interrupted when Drax's men, dressed as a group of medical rescue personnel, knocked Bond out, and constrained both of them inside a fake ambulance speeding toward Drax's base. During transport, Bond escaped from his rope bindings and subdued the paramedic as both fell out of the back of the moving vehicle. Bond's opponent crashed head-first on a gurney into a British Airways billboard, claiming: "We'll Take More Care of You" (sight gag - his head was consumed by the mouth of a smiling flight attendant) (# 11 death, # 5 Bond kill), but Holly remained a prisoner. Bizarrely played to the tune of Elmer Bernstein's The Magnificent Seven theme song, Bond (disguised as a gaucho) rode on horseback to a monastery in the South American pampas (grasslands). The MI6 base was hidden within its monastic walls. "Q" demonstrated explosive bolas, a fake sleeping gaucho with concealed machine-gun, and a deadly hand-held laser gun. The liquid in the vial had been examined - it contained a highly toxic nerve gas (harmless to animals), derived from a chemical found in a rare orchid plant, Orchideae negra, located only in the area of the Tapirape River in the upper jungle regions of the Amazon. Bond was immediately dispatched there - he drove himself in another of "Q's" inventions - an armored Glastron Hydrofoil Speedboat equipped with hidden gadgets. Upon his arrival, he was again confronted by henchmen who launched an armed attack on his craft with explosive depth charges. From the rear of his boat, Bond deployed mines, blowing up one boat (# 12-14 deaths, # 6-8 Bond kills). As he raced forward, two other boats joined in the pursuit - one held Jaws wielding a machine-gun. Bond then deployed torpedoes from his speedboat, and destroyed a second boat with three men onboard (# 15-17 deaths, # 9-11 Bond kills). When Bond's speedboat approached the massive Iguacu Falls, he escaped death when he launched himself from his speedboat onto a hang glider that was deployed from the craft's roof - and he soared away to safety. Jaws (with two other thugs) crashed over the falls (fates unknown, Jaws survived). Bond's glider experienced a rough landing in the jungle, after which he followed a lovely woman (in a white flowing backless gown with a deep V-cut in front) from a waterfall to the interior of an ancient Mayan temple (in Brazil?) - revealed to be Drax's headquarters. Inside, after she beckoned to him, seven other gorgeous females in similar, white low-cut braless uniforms with short skirts greeted him. Distracted, a rock slab under Bond was titled and he was thrown into a pool, and dragged under by a large, slithering reticulated python that constrictively wrapped itself around him. Bond stabbed the snake in the head with a poisonous syringe needle contained in a fountain pen (stolen from Goodhead). As Jaws hoisted Bond out of the water, Drax made a dramatic entrance ("You defy all my attempts to plan an amusing death for you"), and led Bond into a mission-control area where astro-technicians monitored his Moonraker space program. Drax explained the development of his deadly orchids: "The curse of a civilization. It was neither war nor pestilence that wiped out the race who built the great city lying around us. It was their reverence for this lovely flower." Bond followed up: "Long-term exposure to its pollen caused sterility." Drax boasted how he went further to intensify the plant's effect: "Those same seeds now yield death. Not, of course, to animals or plant life. One must preserve the balance of nature." 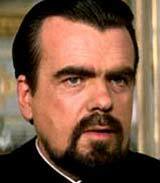 As four Moonraker shuttles were lifting off, Bond asked why Drax had hijacked his own Moonraker shuttle delivered to the US. He had stolen his own Moonraker (one of six to complete his objectives) because another in the fleet had developed a fault during assembly, and he didn't have time to build another one. Jaws escorted Bond to a large room (a launch exhaust chamber) where Holly was being held prisoner - they realized they were directly beneath the rockets of the fifth Moonraker shuttle about to be launched (with Drax as one of its pilots). Above them as he bid them farewell, Drax foretold that they would die in their own "private crematorium." However, the two escaped through an air-vent when Bond activated his Seiko wrist-watch (with plastic explosives and detonator cable). They knocked out the two Moonraker 6 pilots, took their places, and flew the shuttle (on a pre-arranged flight program) into space, following after Drax and the other shuttles and heading for a rendezvous in orbit. Their cargo consisted of six young male/female couples (or "progenitors"), and Drax was conducting a "Noah's Ark" operation to save a genetically-perfect few. His six shuttles transported his elite group of henchmen and women into space where they converged and docked at a secret, orbiting space station, invisible to radar. Drax announced his genocidal plan to create a new "super race" of "perfect physical specimens." Their offspring would return to Earth and recolonize or restart the human race ("shape it in their image") on the cleansed planet (a "rebirth" on "a new world"). During Operation Orchid, the Earth's population would be decimated with the 50 globes (constructed in Venice) filled with vials of his orchid-derived poisonous nerve gas (each globe would kill 100 million people). Once on-board the space station, the two agents located the radar-jamming system and disabled it, to allow its visible detection from Earth. Russian General Gogol (Walter Gotell), seen in red silk pajamas in his Moscow bedroom with a scantily-clad female, agreed by phone to delay military action against Drax's space station when he suspected it was placed there by the US government. That gave 12 hours for the US Marines to determine its origin, and they immediately launched a shuttle spacecraft to investigate. As the first few of the 50 globes were released (to create a "necklace of death about the Earth") from the space station, Bond and Holly were captured by Jaws, and brought to Drax, who was aggravated by Bond's presence - comparing it to the "tedious inevitability of an unloved season." When a giant laser gun was activated to destroy an oncoming US spacecraft sent to intercept the space station, Drax also threatened to place the two agents in an air-lock chamber and expel them into space. To persuade Jaws to be his ally and switch allegiances, Bond pointed out that he and Dolly wouldn't measure up to Drax's "standards of physical perfection" and would be denied inclusion in Drax's rebirth of Earth as a genetic paradise - in fact, they would be exterminated. When ordered to expel the two agents, Jaws reacted in fury and helped them to counteract Drax's "flying stud farm" plan by assaulting some of the guards. When the US spacecraft was within laser firing range, Bond pushed an emergency control switch to disable the gravity-simulator, thereby altering the laser gun's targeting ability. An outer space laser-battle ensued between a platoon of American spacetroopers (armed with hand-held laser guns) and Drax's men in spacesuits (number of deaths unknown). The US spacecraft docked with the space station, and the US Marines intruded into the command satellite, as gravity was restored. Explosions rocked the interior as US troops infiltrated further, and many on both sides were killed by blasts from hand-held laser guns (number of deaths unknown). Bond pursued Drax and when held at gun-point, Bond shot Drax in the heart with a cyanide-coated dart from his wrist dart-gun ("Heartbroken, Mr. Drax") (#18 death, # 12 Bond kill). As Bond ejected him into space from an air-lock chamber, he invited: "Take a giant step for mankind." Meanwhile, Colonel Scott (Michael Marshall), leader of the Marines, had taken control of the command satellite and shut down the globe-launching mechanism. As the space station began to disintegrate, the Marines were evacuated to the shuttle. Bond and Holly raced to Moonraker 5, Drax's laser-armed shuttle, to track and destroy the three globes already launched toward Earth. Meanwhile, Jaws and Dolly were reunited and shared some champagne, and he toasted to her ("Well, here's to us" - his only spoken line), and then Jaws helped release the jammed shuttle, allowing Bond to separate his craft from the space station. The module holding Jaws and Dolly broke off and was propelled deeper into space, later rescued by Colonel Scott's American shuttle. Bond targeted the second and third launched globes, but the first one was more problematic, and their space vessel was dangerously overheating as it skipped on the edge of Earth's atmosphere - and the automatic firing system malfunctioned! In a tense sequence, Bond switched to manual and destroyed the last globe as it entered Earth's atmosphere. The 11th film in the series, the third and final film directed by Lewis Gilbert, and the fourth film with Roger Moore as James Bond. This was the only Bond film in which Bond entered outer space, in part to compete with the Star Wars craze at the time. Bond producer Albert R. "Cubby" Broccoli took advantage of the late 70's Star Wars science-fiction frenzy, with a story derived loosely from Ian Fleming's 1955 novel Moonraker. With an unwise return to excessive and broad slapstick comedy, unnecessary jokes at the end of action sequences, strange pop cultural references, and outrageous sight gags reminiscent of The Man With the Golden Gun (1974). With a production budget of $34 million, and gross revenue of $70 million (domestic) and $210 million (worldwide). It was the highest grossing entry in the series - until GoldenEye (1995). One of the least well-reviewed films of the series. 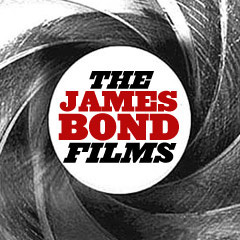 This was the last Bond film to use the title of a Fleming novel until Casino Royale (2006). 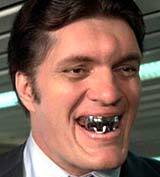 This was the second Bond film with the villainous character of Jaws (Richard Kiel), and the only one in which he spoke one line of dialogue. Set-pieces: the opening pre-title credits skydiving-parachuting sequence against a villainous pilot and then Jaws, the gondola Venice canal chase, the fight in the showroom of the glass factory museum between Bond and Chang, the Sugarloaf Mountain cable-car fight, the speedboat chase on the Tapirape River in the Amazon, and the laser-gun battle in space and inside Drax's space station.